I argue many economics students would benefit of using more WID-type assignments and pedagogy. In this document, I will first present the particularities of economics which must be taken into consideration by instructors and students, and how this affects our love-hate relationship with the written word. These particularities have influenced our assessment design. Secondly, I will present the learning objectives that can be met with WID-type writing assignments. 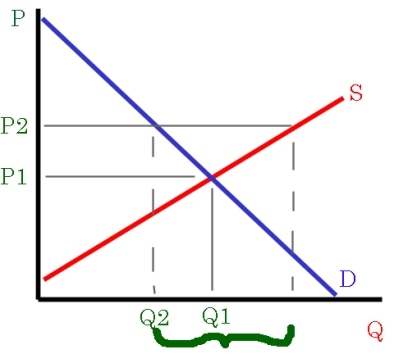 I will finally present specific assessments and tricks proposed by the WID movement that may be used in economics courses. In the past 40 years, economics has become very heavy on math, and light on writing. Why? First of all, economics is about complex issues: markets, consumer behaviour, labour trends, competition and prices, policy and the role of the State, wealth and poverty, as well as the inherent interdependent nature of all sorts of variables. Math is great for boiling issues down to a synthetic format. It is especially useful when the relationships are complex. More complex relationships mean more deductions, which mean more theory, which mean more math. Second, economists do not gather their own data, as would psychologists or sociologists. Economists have grown accustomed to use data available from statistical agencies, for example. They have thus been trained heavily in statistical analysis, which is inherently mathematical. These formal models hold many advantages: they are logical, they can depict very subtle relationships, and they are universal in exposition. Also, they are not “political slogans”, to paraphrase Paul Krugman. Policy debates can be heavy on ideology, and rhetorical tricks, whereas formal modelling is constrained by a strict thought process. This does have many disadvantages: First, most people do not speak math. Economists still have to write to communicate their ideas. Second, formal models have not been very successful at withstanding the test of empirical verification. Third, too much deductive logic can be a bad thing. Many of the very important insights in economics were drawn from grounded and inductive thought processes.1 Fourth, models still need to be explained in words, and details can be lost in the translation from math back to English. 1 Adam Smith’s ideas on division of labour were based on field work, observations made in British factories. John Keynes’ ideas on investment demand for money were based on his own experience as an active investor and the observation of his investor colleagues. The Philips Curve is the result of an engineer turned economist’s observations of raw data without any link to formal theory. How do we teach and measure knowledge of economics? This is the key question to this whole presentation. Most teachers believe students have different ways of learning. Some are visual, so we use the black board or produce PowerPoint presentations. Some students are auditive, so we talk a lot! Some students are readers, so we provide a textbook. Some students are problem solvers, so we organize group activities. Some students learn by saying things aloud, so we prompt them for participation in class. In Engaging Ideas John Bean agrees that a good teacher has to vary his techniques in order to “get to” a higher number of students. But he proposes that even though students are not all the same, ALL teachers of ALL disciplines can use more writing to help students learn more content. He noticed that students often do their best writing when they are not in their English classes. Students like to write about real issues, which they learn about in disciplines such as economics. Also, he believes students need to write, as a learning process. For economists, that means some adjustments, tweaking, and maybe a few minor overhauls. B. How can writing help learning? Our measurement of learning will probably always be imperfect and highly qualitative in nature. But writing assignments are actually very good tools to measure learning and convince the instructor of the students’ progress. For many people, the first draft of an essay is an opportunity to lay out ideas on paper and work them through the rigours of logic and reason. Typically, ideas and arguments become clearer and stronger as the reader works his way to the end of the text. This is proof, according to Bean, that the writer has improved his thinking on the topic, WHILE WRITING THE PAPER. An experienced writer will sleep on this draft and rewrite it later on in a way that is more pleasant to read for others. Compared to oral presentations, writing is an inexpensive and effective tool for hashing out ideas. This means improving thinking. As a bonus, it helps to memorize material. How can we change our assessments? WID-type writing can meet specific teaching objectives such as: learning progression, knowledge of concepts, comprehension of relationships and problem solving. It also gives the student an opportunity to connect to the material on a personal level. Apart from progression, our assessments already cover knowledge, relationships and problem solving. So why should we change? Two reasons: A- It would help some students learn more and faster. Who is against this? And B- it would help students engage with the material, increase class participation and interest. In a nutshell, more writing can help economics students learn more economics. This is not about learning to write. This is about writing to learn – in the discipline. Sadly, many of our students dread the idea of studying economics, partly because the Introduction course is mandatory. It is therefore important for instructors to use tools that help students engage with the material as much as possible. The following tips have been introduced to me in the Writing in the Disciplines Fellowship, and particularly via the work of John C. Bean, professor of English at Seattle University, and the author of Engaging Ideas. I always assign a draft and a final copy. But to make the final product more interesting for both the student and the instructor, I assign strikingly different prompts. The first assignment is a “Think Piece” (see below), a personal essay where the student must interview a family member about an economic topic such as unemployment or inflation. The objective is to get the student involved and engaged in the material, as it is presented in the later weeks of the semester. This draft is commented, and graded. I don’t correct grammar and spelling. I expect a thesis to be buried somewhere at the end of the essay. The final draft has to include authoritative sources such as The Economist, and forces the student to relate his family story to actual economic theory. The final draft is not commented in detail, only graded. The Think Piece is an exploratory writing assignment that helps students engage with the content of specialized courses. This can be used in conjunction – or not – with the essay assignment. Students usually do their best writing when they feel a connection with the material. The great advantage of exploratory writing is that it enables students to feel as though they are participating in their learning process. They are encouraged to argue their point of view. They can also use their own past experiences, family lore and social issues to relate to topics discussed in class. Here are a few examples of exploratory writing assignments. PROMPT: Write a one-page think piece about the link between the level of taxes and the number of entrepreneurs in the economy. What would you do about this if you were the Quebec Premier? PROMPT: The workers at the shoe store where you work want to set up a union. Would you vote in favour of this, or against? Detail 3 arguments to back up your vote. PROMPT: The economy is running too quickly and inflation has begun to increase. You are the chief economic adviser to the current Minister of Finance – whom you secretly despise. Design a couple of Fiscal and Monetary Policies that are completely wrong for the situation, and that are sure to quickly embarrass the Minister. What are the consequences on the Government Budget, Aggregate Demand, and the overnight interest rate? Explain in words, and show using AD-AS graph.